Here we will explain the procedure for attaching tags to business cards. 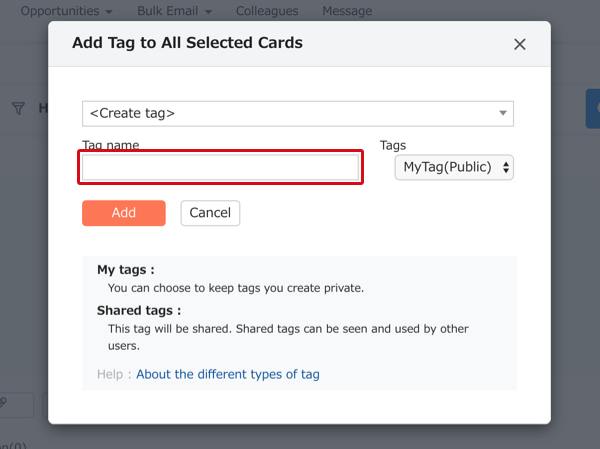 "Attach tags after scanning from PC": With this you can add tags to individual business cards or to whole groups of business cards at once. ・Depending on the type of tag (disclosure level), there are tags that can be attached and tags that cannot be attached. ・There is no limit to the number of tags that can be attached to a business card. ・Tags have the concept of "owner". The person who makes the tag is the owner. The name inside the parentheses on the tag management screen or the business card detail screen is the name of the owner of the tag. For example, "Sales Manager List (Kenji Yamada)"
・Choose conditions, and then search for cards you wish to attach tags to. Put checks in the checkboxes on the search result list to choose cards. If you would like to attach the tag to all the cards in the list, put a check in the red box at the bottom. 1. Choose conditions, and then search for cards you wish to attach tags to. Put checks in the checkboxes on the search result list to choose cards. If you would like to attach the tag to all the cards in the list, put a check in the red box at the bottom. 2. After choosing the cards, from "Tag", choose "Add Tag to All Selected Cards". Input the name of the new tag into the red box, choose disclosure level, and then press the "Add" button. Choose a tag from the pull down, and then press the "Add" button.